offers several advantages over equities trading. *200:1 is the entry leverage value. Brokerages will have margin calls set at different levels, exact leverage may vary. *The trader's cost of doing business is called the Spread. It is the difference between the bid and the ask prices on your chosen currency pair. 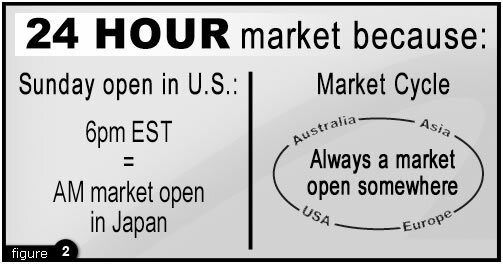 Forex is a true 24 hour market, 5.5 days a week, which offers a major advantage over equities trading. Investors are able to trade at odd hours, thus allowing more flexibility for personal, business and social activities. Whether trading at 8am, 2pm, or even 2am, there will always be buyers and sellers actively trading foreign currencies. Such flexibility allows traders to immediately respond to breaking news and other political factors driving the market. After hours trading in the equities market has several limitations. In the US, for example, equities traders have access to ECNs (Electronic Communications Networks), also known as "matching systems". These networks are established to provide a method for equities traders to buy and sell amongst each other. Such networks are usually not able to offer as tight of spreads as would be offered during normal market hours, thus most trades are not executed at a fair market price, subsequently there is no guarantee that every trade will be executed. An investment market with lacking liquidity, or a lack of buyers and sellers at certain times, is often the demise of traders who need in or out of the market without delay. The global network of governments, banks, corporations, hedge funds, and individual traders that collectively drive the Forex market, are in essence, also driving the world's largest network of liquidity. Such high trade volume works to ensure trade execution and the stability of prices, regardless of the time of day. Equities traders, on the other hand, are more susceptible to liquidity risk and are subject to potentially wider dealing spreads and larger price movements. 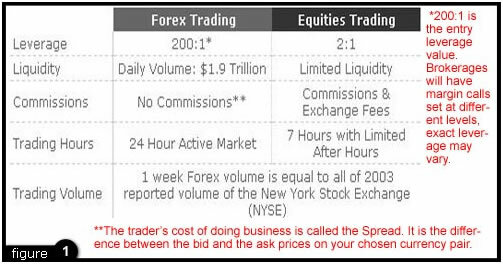 Liquidity in the equities market really does pale in comparison to that of the Forex market. Leverage is the key to understanding the risk associated with trading the Forex Market, and of course, the potential for gain. 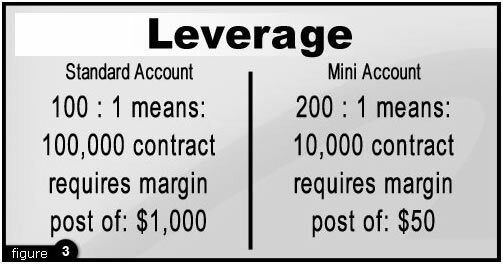 Many Forex brokers offer leverage as high as 200 - 1, meaning that $50 of margin would control a $10,000 position in the market (this is an example of a mini lot). Forex trading is often attractive to investors coming from the equities market because Forex trading offers such high leverage. It is important to understand why Forex brokers offer higher leverage, and of course... the dangers associated with such. To some extent, higher leverage is a necessary evil in the Forex market. It can offer advantages over equities trading, but only if it is properly understood and utilized. Though currency values on a global stage are constantly in a state of flux, high liquidity and market stability translate to relatively small daily price movements. In fact, average daily movement is around 1% on most major pairs. Compare that to the equities market, where average daily movements are closer to 10% and it is not hard to understand why large contracts are needed in order to yield profits on intraday price movements. Without high leverage most retail investors would not be able to afford trading in the Forex market. However, with increased buying power comes increased risk. Traders who are new to the market often make the mistake of over-trading their account. Because relatively small margin is required to open large positions beginning traders often make the mistake of opening too many positions at one time. A quick market move can then result in substantial losses. JMI Brokers would advise any trader new to the Forex market to trade only a very small percentage of their account at any one time. Like any market, there is always a buyer and a seller the world of currencies. The potential for profit will of course rally between the buyers and sellers, the longs and the shorts. Trading currencies in pairs offers the advantage of speculation from either side, but it is the volatility in combination with excellent liquidity that offers currency investors a true advantage over any other market. Regardless of the time of day, traders in the Forex market can long or short any currency pair of their choice. Many brokers also offer hedging, meaning that traders can take a long and short position on the same currency pair. The market's volatility provides the constant potential for gain, and of course, the constant potential for loss as well. Forex trading can be risky, but execution in or out of trades should not be a problem when trading through a reputable broker. Equities traders, on the other hand, may have a much more difficult time liquidating stocks when the market is moving against them. The off-exchange retail foreign currency market (or Forex market) has many differences, as outlined above. However, one of the most significant factors is the element of risk. The Forex market is the riskiest of all investment vehicles and is suitable only for experienced traders. The higher leverage and volatility found in this market increase the traders risk of loss. There is the potential to lose, all or more, of your original investment.